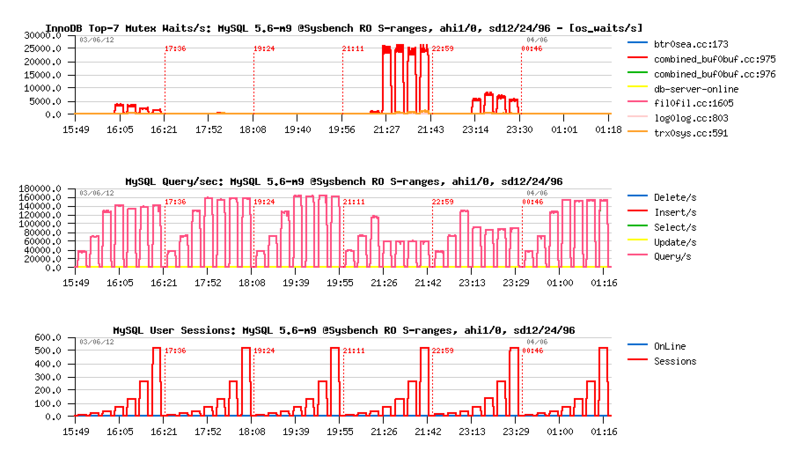 I'd say that during last years there were plenty incredible events around MySQL Performance. 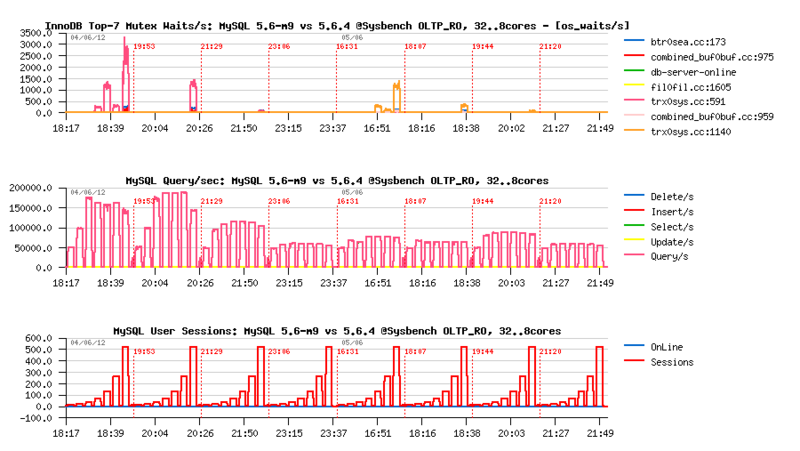 And one of them is a story about Read-Only performance in MySQL 5.6 -- it's quite fun to tell it now, but, believe me, it's even more fun to live it yourself ;-)) Every important milestone around performance improvement in MySQL was similar to resolve a Detective Story ;-) Probably one day somebody will take a time to write a book about ;-)) But for my part, I'm just sharing what I've found interesting and important..
First of all: why even care about Read-Only performance in MySQL/InnoDB ?.. - Well, except if your database is "write-only", but usually data reads are representing a significant part in OLTP activity. And if your database engine is transactional, the reads from such a database are not "simple reads" -- they will also be a part of transactions, hitting different level constrains to match committed-only data or accept "dirty reads", etc. etc. etc. 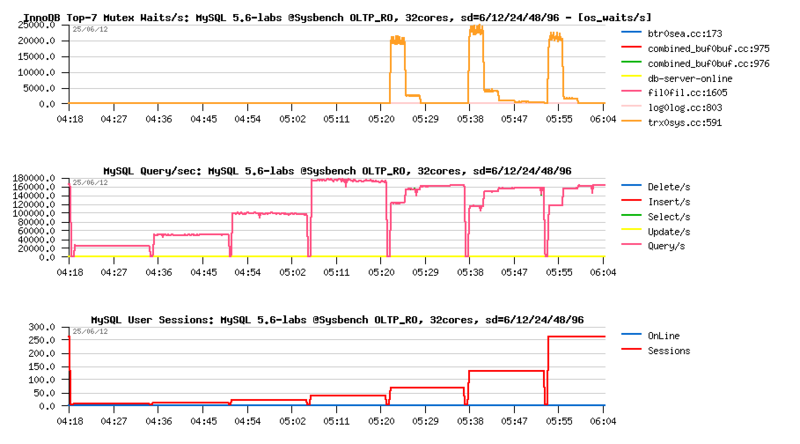 -- just to say that it's not as simple as it looks like ;-)) And on the same time read-only or read-dominated performance represents very significantly an overall database engine design, as it'll fire the most critical internal bottlenecks and give us an idea about its true scalability limits.. 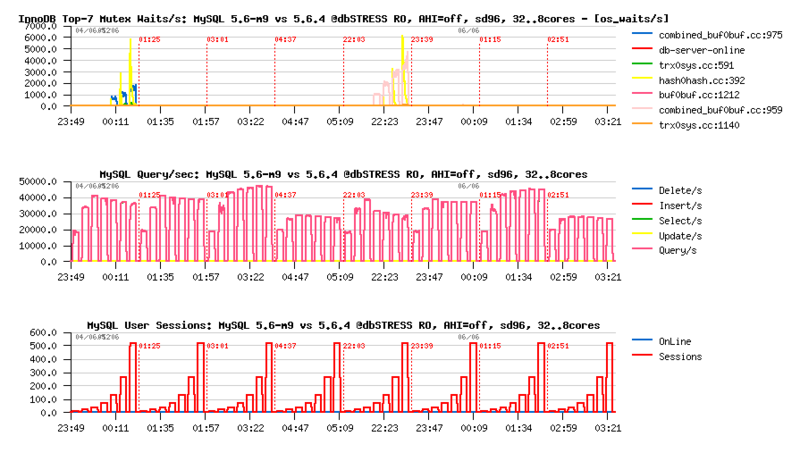 So far, it's more than a year ago there was shipped the very first working MySQL 5.6 version. It was in April 2011, MySQL 5.6.2 came with one of fundamental changes -- kernel_mutex contention was finally removed within InnoDB!.. This contention was seen as the main scalability stopper on many kind of workloads (including read-only). And Sunny made an incredible work to split kernel_mutex into several mutexes within InnoDB! The result of this work looked very promising. However, there is always a risk that by resolving one contention, you're also making another one more significant (which was simply hidden for the being time by the first one, which was more important until now).. - And it's exactly what happened in MySQL 5.6.2: instead of kernel_mutex contention we moved now to the TRX mutex contention (trx_sys), and in some particular cases performance became even worse than before.. You may find more details about in my MySQL 5.6 notes articles. if you're using auto-commit turned ON, there is even nothing to do, InnoDB will do all the stuff "automagically" for you! ;-)) -- if you're not using BEGIN/END/FOR UPDATE in your SELECT queries, they will be automatically turned into READ-ONLY transactions and most of transactional overhead will be avoided during your SELECT execution! 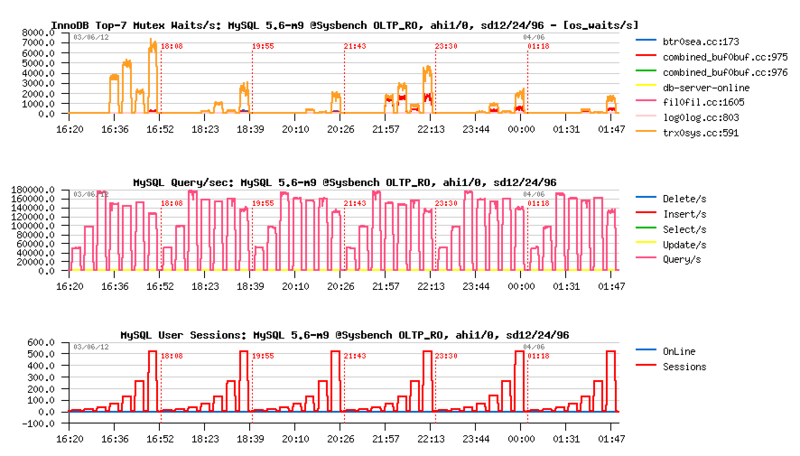 otherwise you may explicitly START TRANSACTION READ ONLY and get the same performance benefit for your SELECT queries! For more details, please read the Sunny's article explaining all the related stuff and presenting impressive benchmark results on Sysbench! Then we entered into the most painful period, when you're asking yourself several times per day "do you really see what you see?.." and "do you even believe to what you see?.." since introduction of READ-ONLY transactions, near no other/new contention was reported by InnoDB during read-only workloads..
however, we were still unable to significantly out-pass 16 concurrent users sessions performance on servers with more than 16cores..
it was clear there is still a contention somewhere in the MySQL or InnoDB code..
and on this step we were really happy to use PERFORMANCE SCHEMA (PFS) as it's the only way to trace a time spent on every levels of MySQL code (particularly on mutexes and RW-locks in the given case)..
monitoring with PFS clearly indicated that the most of time is spent not on the LOCK_open mutex and MDL related locks! by chance, Mikael already started to work with Dmitry Lenev to remove LOCK_open contention, but the final solution was not ready yet on that time..
to get an idea about potential gain in MySQL 5.6 performance once the LOCK_open mutex contention will be fixed, Dmitry made a "dirty patch" removing completely the use of LOCK_open and/or all MDL related stuff (just for testing propose only)..
as you can see, within all test series QPS level is exactly the same!.. however, according PFS, time spent on trx_sys mutex is quite important..
#3 - both LOCK_open and MDL_lock times are gone.. - but performance still remained the same?.. - how it's possible?.. Of course, the most important improvement now was expected from the LOCK_open and MDL patch. However, once again, for our big surprises, removing any use of LOCK_open & MDL stuff did not bring any changes... Why?.. - a more detailed analyze with PFS showed that the most bigger amount of time was now again spent within TRX mutex contention! And it became quite clear, that until TRX mutex is not fixed, there will be no any benefit at all from LOCK_open and MDL fixes.. I'd say it was little bit frustrating to observe so high TRX contention even after so impressive speed-ups in already achieved performance levels.. But well, Sunny again, by analyzing code around mutex contention came with conclusion that increasing of wait delays during mutex spins will help to lower observed contentions! - Interesting that innodb_spin_wait_delay setting variable existed from a long date within InnoDB, but I never saw it helping to reduce any mutex contention before ;-) But now, since we came back to pure code contentions, this setting started to shine again! 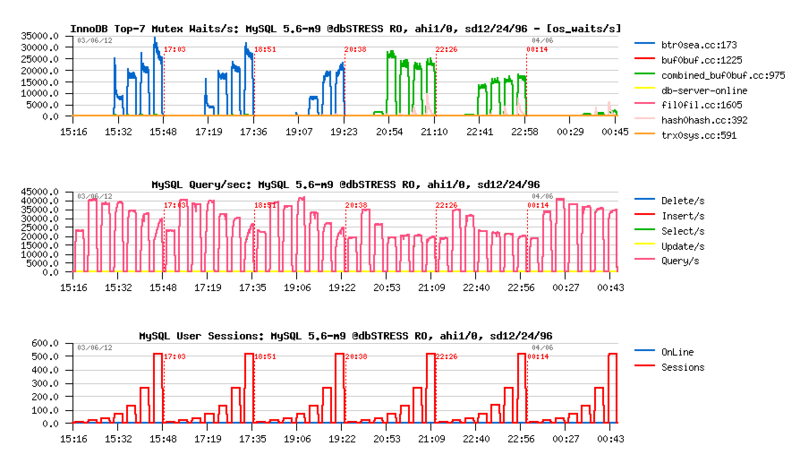 and as you can see from the upper graph -- the regression is due increased contention on the TRX mutex with a growing workload.. But what exactly the meaning of this setting within InnoDB?.. And only then, after all this improved stuff, we finally were able finally to see the benefit of the latest improvement in MySQL server code and made by Mikael and Dmitry Lenev -- split of LOCK_open mutex contention!.. This gave us yet another 10-15% performance improvement! 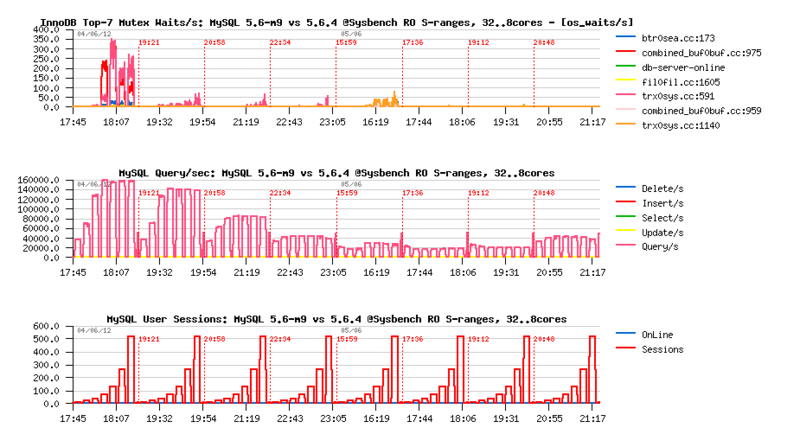 So, as you see, MySQL 5.6 is coming with huge improvements in performance! 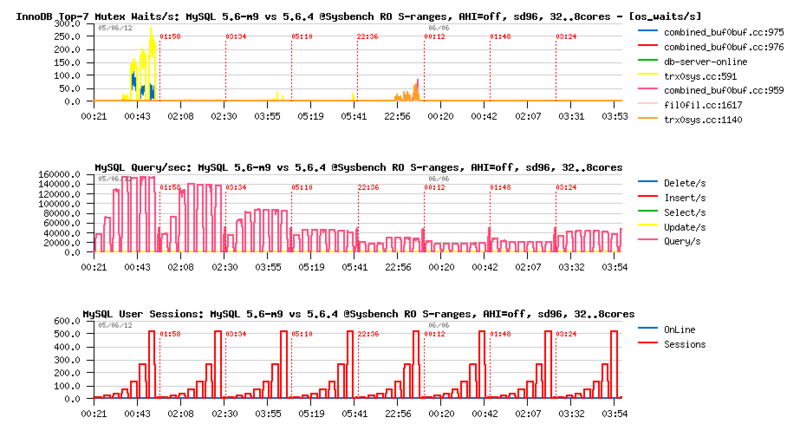 However for the moment the "innodb_spin_wait_delay" is playing a significant role for InnoDB performance tuning. Let's go little bit further now, and see what happens now to other stuff like AHI, and where we're now with an overall scalability limits..
with AHI=Off the main contention is moving to the Buffer Pool mutexes, and setting spin delay=96 is the most appropriate.. 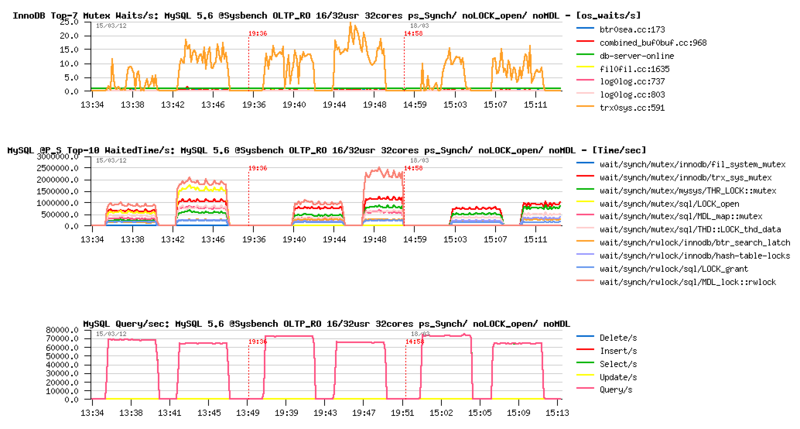 NOTE: interesting that with AHI disabled performance is still not better..
also, independently to AHI setting (On/Off), the main contention on this workload is remaining on the Buffer Pool mutex..
TRX sys mutex seems to be the main contention on this workload.. So, from the previous results, seems to me that for the scalability tests I have to use spin wait delay set to 24 when AHI=On, and 96 when AHI=Off. Let's get a look on results with AHI=On first. 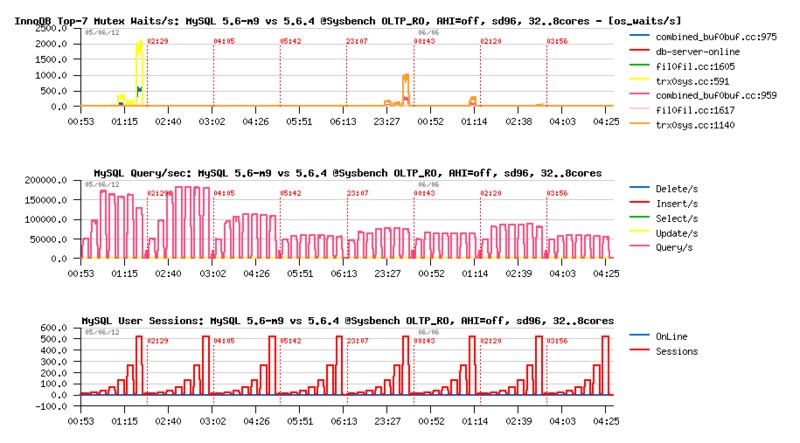 then the same test series, but for MySQL 5.6.4..
first surprise is to see the contention on "btr_search_latch" completely disappearing from InnoDB reporting once only one thread per core is used..
well, dbSTRESS-RO should be yet more investigated..
while on 5.6.4 the best result is reached while only one CPU socket is used (hitting the cache line issue fixed within April's 5.6-labs)..
5.6-m9 performance on 32cores is better than on 32cores bi-thread, seems that TRX sys mutex contention is increasing in this case..
while 5.6.4 is getting a better performance on 16 vs 8cores, but loosing it on 32cores again (hitting here CPU cache line issue + other internal contentions).. NOTE: Interesting that results with disabled AHI are quite similar to those with AHI=On, but performance is still better when AHI is turned ON. 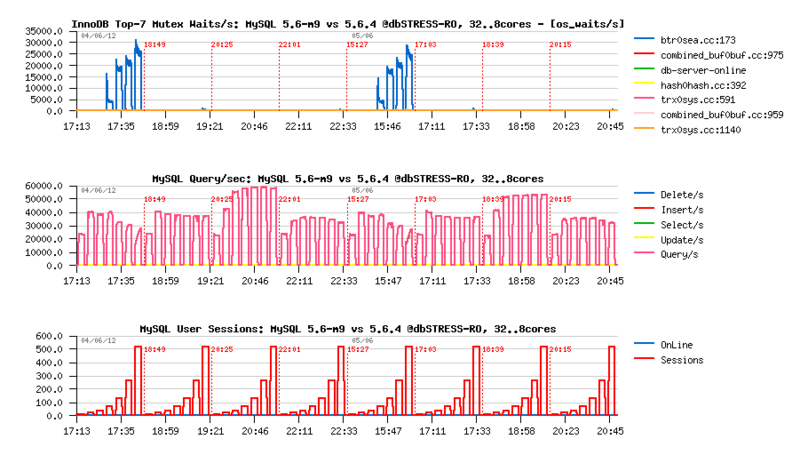 And, yes, it's clear I'm hitting another "hidden bottleneck" within MySQL 5.6 on dbSTRESS workload..
As usually, comments are welcome!